Paws Unleashed is a small family owned business that began in 2011 as Ruff N' Ready Dogs. Owner Caitlin Olausen is a certified professional dog trainer and has over 9 years of experience in the field. Opening this facility has been a dream in the making for many years now. "We have finally found the perfect space and are so excited to share it with you!" Services: We currently offer dog daycare, boarding and training. We also offer limited spa services for our daycare and boarding guests. Playgroups: We have designed our facility to accommodate dogs of all sizes. We have designed a large indoor and outdoor play area specifically for our small dog guests to enjoy. The large dog play areas have been made to keep the dogs moving, busy and engaged throughout the day. Paws Unleashed is the perfect opportunity for your dog to come socialize, explore, learn and grow. Outdoor Space: We have large outdoor play and potty areas fully equipped with k9 grass which is an artificial turf specifically designed for dogs with cleanliness and safety in mind. Staff: Our staff is trained to watch over your dog's group interactions, play style, eating habits, health, and emotional well-being. 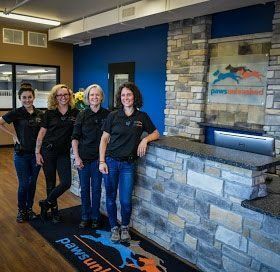 Paws Unleashed keeps the dog to staff ratio as low as possible to insure the dogs have proper supervision and training implemented throughout the day. We make sure our staff works as a team and always has your dog's best interest in mind. We are very picky about who cares for your pet. Cage Free: Your dog is not put in a crate, cage. Kennels are only used for meal times, parent requests, illness or injury, and behavior issues. Health: We have strict vaccination, health, and sanitation policies in place to keep the risk of illness at an absolute minimum. If we become aware of an illness going around, we will post the illness to our web page so you can check anytime and be aware of any sickness that may be going around at anytime. Medical or Behavior Issues: We will notify you of any minor medical or behavior issue, or potential issue we discover when you pick up your dog. We will notify you of any significant medical or behavior issues right away. And, in the event that a problem occurs while you are unavailable, we will handle the problem promptly on your behalf with your dog's safety, health and happiness as our top priorities. Our Mission is to provide your dog with a fun, clean, and safe place to play, learn, and grow. Our experienced, caring and knowledgeable staff, high quality cleaning and safety practices, strict vaccination policies and extensive evaluation process ensure that we are able to provide the highest quality care for your dog.